We are very excited to participate in this awesome contest – a lot of great entries so far ! Thanks for giving us the opportunity to share our stuff. Our brew is a crazy action game, designed for people with a sense of humor So don’t ask questions, just jump right into the action. Hope you enjoy!!! It was one of those perfect sunny days at the farm, until all heck broke loose. 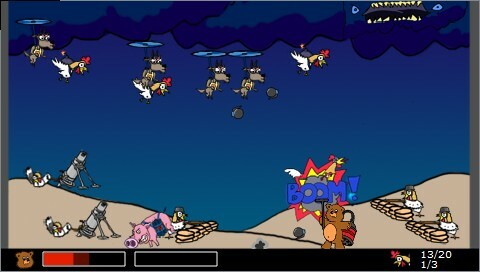 Who would have imagined that all the animals would suddenly turn berserk and start bombing the place to pieces? Would you? I certainly wouldn’t. But Evil Teddy, the adorable, cute and fluffy mutant hero assassin from space, is prepared for anything. And I mean ANYTHING. Now let’s get some action. 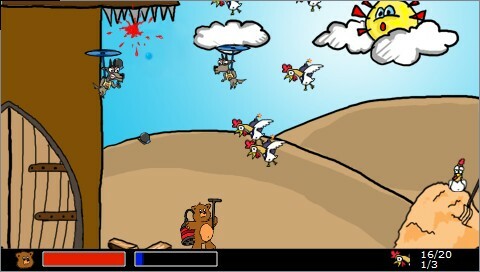 Take control of Evil Teddy and defend the farm from the terrorist suicide-bombing animals. Use the weird vacuum machine to push them into sharp spikes on the ceiling. Watch out! They have bombs! Please, don’t waste valuable time on asking why. We need to save the farm, now!!! You are mean. You are merciless. You are bad-***. Use left & right to move, triangle to activate Evil Power and X to use vacuum. Alchemy Studios is an independent team of programmers and designers located in Poland. We satisfy our creative minds only by developing casual games for PC, PSP and cell phones. If you want to join the team and participate in some creative and fun game dev action – pls drop us a message at alchemystudios.games@gmail.com. Last edited by Blue_AlchemyStudios on Mon May 30, 2011 8:18 am, edited 1 time in total. I like this Game, its funny! Good Graphics and good Sounds, all in one Good Game! this is a really good game..
thanks,And hope you get excepted into the gen comp. Very nice entry, welcome to the competition! Its great,funny and kick-a** game!